This piece of architecture is called 'The Arbour' and weaves through the centre of the parklands for one kilometre, leading the way to the parklands’ many attractions. 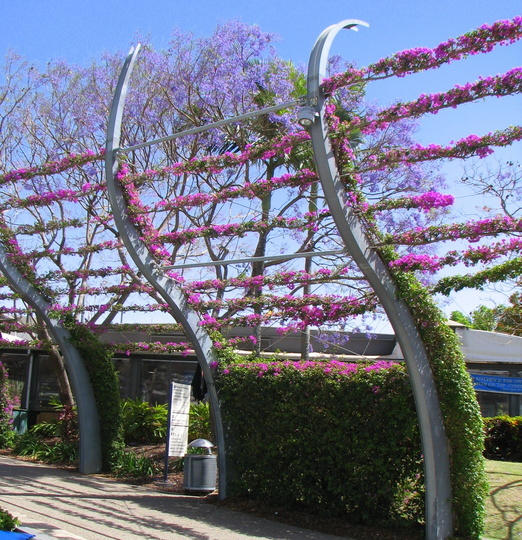 It is made up of 443 curling, tendril-like columns of steel, each covered with a train of magenta bougainvillea plants. Lots of gardens in my part of the world do indeed have bougainvillea growing over pergolas, over sheds, over fences and up through tall trees. At my last house, we had two bougainvilleas intertwined and growing up the side of our garage - just beautiful. The only problem with them is that the thorns make it very difficult to trim - they tend to get away because they're so difficult to handle. Thanks Yorkshire and Pansypotter - it is a stunning sight as the bougainvillea flowers for most of the year. Very attractive setting for a park! Yes Lindak - I agree ... it's nice to see a piece of architecture designed to make the most of something from nature. I immediately thought it looked like a huge wave just at the point of rolling over and crashing back down again. Actually I think ocean waves were the inspiration for the designer Lindak - great minds think alike! I love the tree in the background!!! That is beautiful. The jacaranda is my favourite tree ... I finally have one in this garden (after wanting one for years and years but never being able to plant one in my other gardens) and it's just begun flowering again. This photo was taken down in Brisbane and that city has the most jacarandas I've ever seen - magnificent when they're all in bloom! PS thats the bougainvillia i mean not me !! Haha - yes I got that Shamrock. Bougainvillea is everywhere here - it's just something that's always in the background and perhaps rather under-valued! This particular structure though sure brings it to life. Thanks Arsh - this is a wonderful place for a stroll.